Finding a balance between my love for my job and my love for exploring the outdoors is tricky. 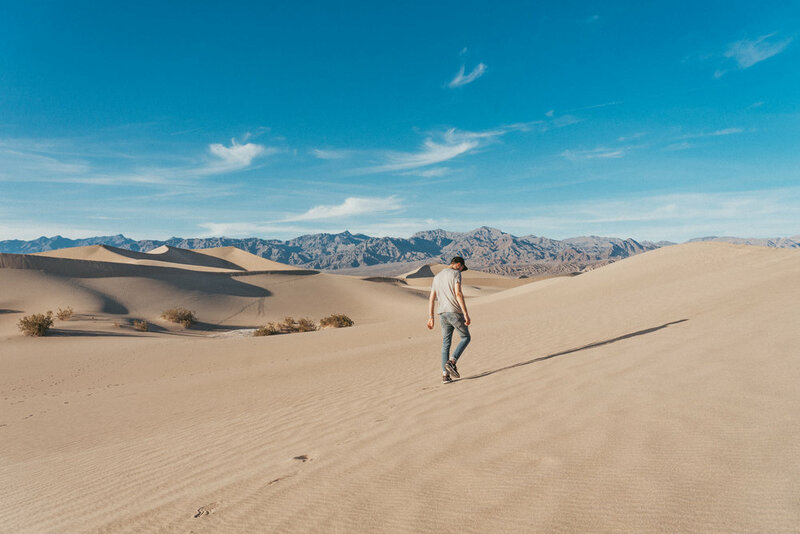 Paid time off in my industry is precious, so it usually comes down to packing three days worth of adventure into one day - which can be intense, but I’ve found I’m starting to get the hang of it and our most recent trip to Death Valley National Park was proof. Without feeling rushed, in one day, we managed to see some of DVNP’s heaviest hitting attractions and I’m excited to share our successful itinerary with some of you other weekend warriors. Before jumping into the attractions, let’s talk lodging. Death Valley has numerous campsites and hotel options. For this itinerary, I recommend either staying in Stovepipe Wells or Furnace Creek. Stovepipe Wells Village is home to the Stovepipe Wells Hotel. Here you will also find The General Store and gas station as well as the Badwater Saloon, Toll Road restaurant, a gift shop and a ranger station. There is also first come first serve campsites in this area (190 sites) or if you’re traveling by RV you can make a reservation through the hotel. Furnace Creek also offers full service hotels and camp sites. At this location you can either stay at The Ranch at Death Valley or The Inn at Death Valley - both affiliated under The Oasis at Death Valley. The Ranch is your more family-friendly option, while the Inn is more of an adult crowd and offers more elevated amenities. The Oasis has a couple of restaurants, pools (accessible only by guests), horse back riding, gift shops and more. There are also a number of camp sites in the area. Furnace Creek campground accepts reservations (but make sure you book far in advance - this site books up fairly quick) while Sunset camp ground and Texas Spring camp ground are both first come first serve. We chose to stay at the Ranch - it was the most affordable (other than camping) and reliable option - plus it was the perfect home base for all of our excursions. I had read all about how beautiful the sunrise is at Zabriskie Point, so on Saturday morning, we woke up around 5:30am, pulled ourselves together and drove the 10 minutes up the 190 hwy to the Zabriskie Point overlook. It was an amazing way to start the day, and while we certainly were not alone, it was one of the most peaceful, serene moments of our trip. There must have been at least 30 other people standing beside us, cameras at the ready, on the overlook, but there seemed to be an unspoken understanding - no one spoke above a whisper and everyone respected each other’s space. The view from Zabriskie Point is unimaginable. Below you are the winding golden canyons of the badlands, beyond that, the pure white salty surface of the salt basin and then furthest in the distance the Panamint range seems to jut up out of nowhere showing off Telescope Peak’s snowy top. Watching the sun rise from this location is magical, although I’m sure catching a sunset here is pretty surreal as well. After taking in the scenery at Zabriskie Point, we decided to get squeeze in a small hike while we still had the cooler temperatures of the morning. 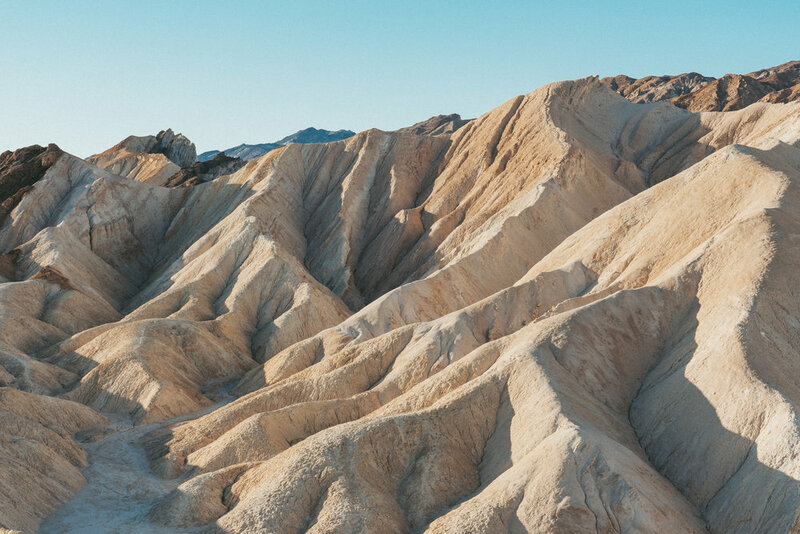 We wanted to explore the surrounding terrain a bit more so we chose to hike the Badlands Loop trail that begin at the bottom of the paved road leading up to Zabriskie Point. The 2.5 mile loop trail winds your through the badlands where you’ll have views of Manly Beacon and Red Cathedral as well as pass by some of the areas old Borax mines. After we concluded our morning excursion we decided to head back to the Ranch to grab some breakfast from the buffet and change into clothes better suited for what we knew would be a hot afternoon. The buffet was definitely worth the $15 per person charge. We loaded our plates up full of yogurt, fruit, biscuits and eggs, knowing we’d have a long day ahead of us. After breakfast we headed out to Badwater Basin. Knowing there would be zero shade at this particular attraction we planned on hitting this area as early as we could - by 10am it was already 85º, but believe me, it felt hotter! Badwater Basin was such a surreal experience. 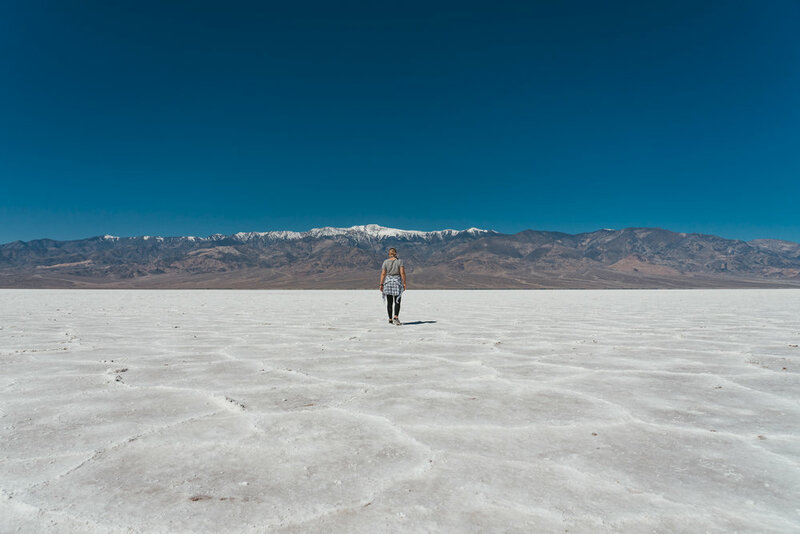 At 282 feet below sea level Badwater Basin is the lowest point in North America. This particular area gets very little rainfall (less than two inches every year) water gets trapped inside the basin, then evaporates and leaves behind mineral deposits that cover the basin looking like fresh snow. In order to reach the snow white, hexagonal shaped, salt flats you have to hike about 1/2 mile. The walk out to the flats feels so close, but still so far (a reoccurring theme in this particular desert). The vast white basin juxtaposed against the massive Panamint mountain range is such a sight and you really can’t take a bad picture here. As the sun moved higher in the sky the basin began to heat up even more, so it was a good time to head out to the Natural Bridge Trail for a light, semi-shaded hike. As we made our way back towards Furnace Creek the turn off for Natural Bridge Trail is just 10 minutes from Badwater a the end of about a mile long unpaved road. Natural Bridge Trail lead you to… you guessed it… a natural bridge! Throughout the years differential erosion created the impressive 50ft conglomerate rock bridge. It doesn’t look like much in photos, but seeing it in person you really get a sense for it’s massive size, spanning from one side of the canyon to the other. The trail is well marked, and while I would say just about anyone can accomplish this hike, even so, hiking up hill through the gravel-like sediment is a bit of a slog. Luckily, it’s a fairly short jaunt (maybe 15 minutes) to reach the bridge and it’s a beautiful spot to seek refuge in the shade before continuing on, or heading back to the your car. From the Natural Bridge turnoff, about 4 miles North along Badwater Road you’ll find Artist’s Drive. 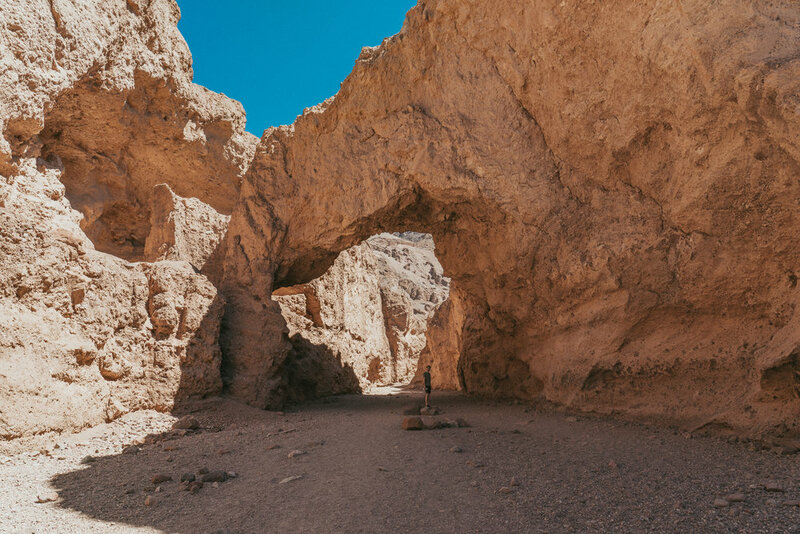 Artist’s Drive is a one-way road that travels south to north so it is an ideal adventure if you’re heading back to Furnace Creek like we were. Artist’s Drive meanders through the mountainside above the basin and is composed of super vibrant soil colored by rich metals from volcanic activity throughout the years. The scenic drive also passes by a popular attraction called Artist’s Palette. Here, the bright patches of soil along the mountainside are so bright and scattered - reminiscent of a Jackson Pollock piece - it’s really a sight to be seen and so hard to capture in a photograph. After spending the entire morning in the Death Valley heat, we decided to finally head back to Furnace Creek to cool off and eat lunch. We posted up at The Last Kind Words Saloon and filled up on BBQ Pulled Pork and Potato Skins - a heavier lunch than we wanted, but gave us plenty of fuel for the rest of the day ahead. Salt Creek was a surprise favorite on our itinerary. After fueling back up during lunch, we decided to head toward Stovepipe Wells. Initially, we were just going to post up at the dunes, but along the way we decided to take the road toward Salt Creek - a quick, and fulfilling detour. This seasonal stream of salty water is the only home of the rare Salt Creek Pupfish who we were lucky enough to catch a glimpse of! 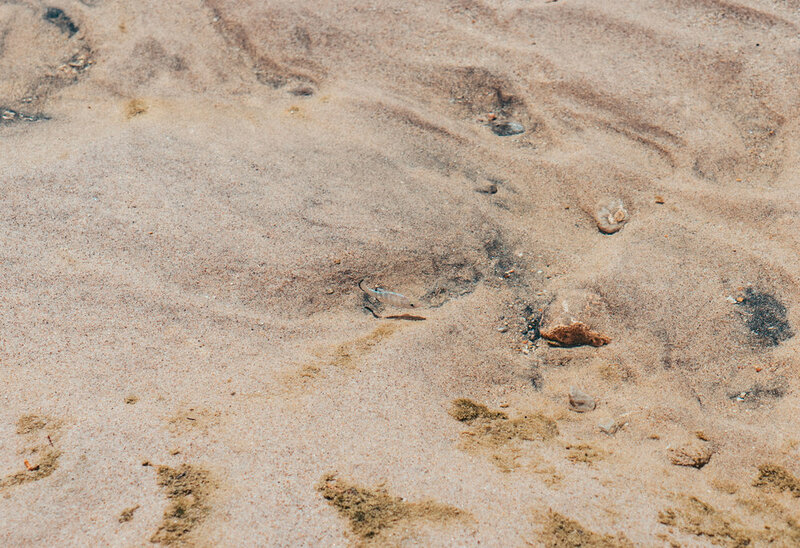 While the Salt Creek Pupfish’s ancestors long ago swam in freshwater, this subspecies had to adapt to live in saline water and every March and April you can catch them squirming around in the shallow waters defending their territory and attempting to mate. 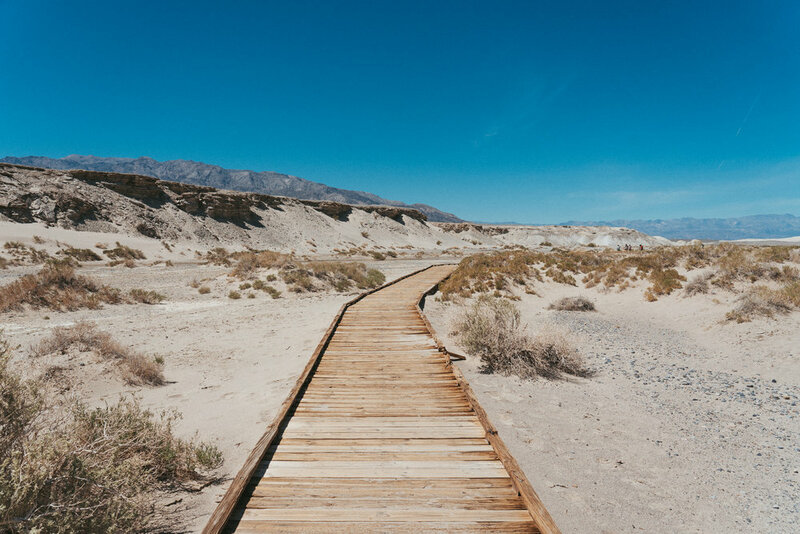 The boardwalk loop around Salt Creek is a quick 1-mile lollipop loop, and though it may not seem like much for a creek anywhere else, it sure feels like an extraordinary oasis in the dry depths of Death Valley. Our last stop of the day was out to Stovepipe Wells to catch sunset at the Mesquite Flat Sand Dunes. This was definitely the highlight of my trip. 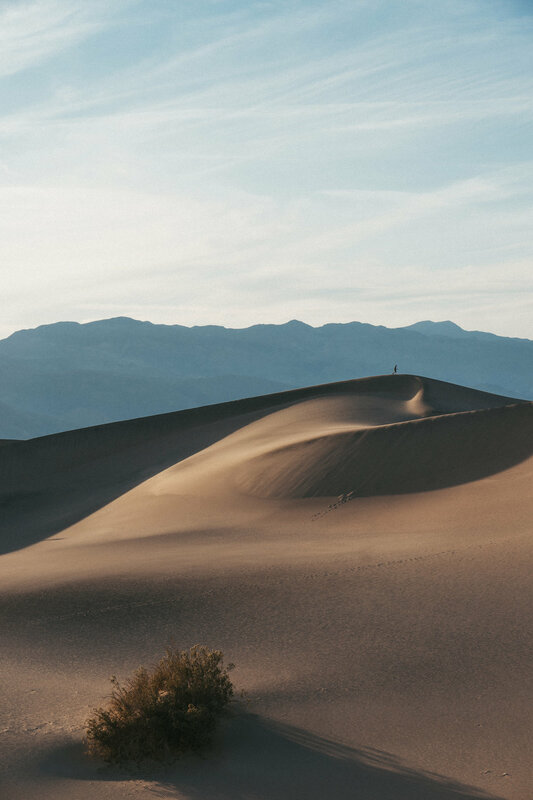 Mesquite Flat Dunes are the most easily accessible dunes in Death Valley and rise over 100ft from the ground. I had never seen dunes like this before - it’s hard to imagine that there are other dunes in the area, like Eureka and Kelso, that are nearly 6x higher than them! This was the perfect spot for sunset. If it’s not too windy, you could settle in with a blanket and watch the sunset turn the surrounding hills from pink to purple. Or, if you’re feeling super ambitious, stick around after sunset and do some amazing star gazing. 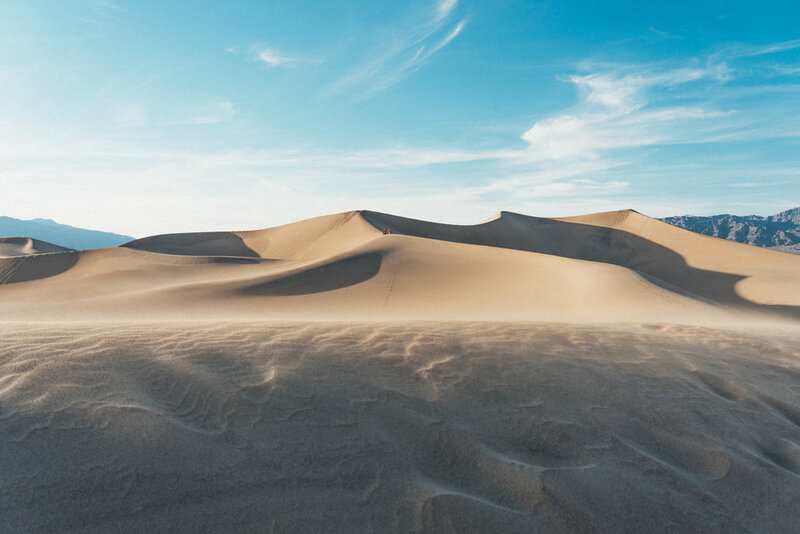 There is no official trail to follow, but if you’re looking to get away from the hundreds of foot prints and find some more pristine sand, you’ll need to hike about a half mile out towards the highest sands. The sand can be a bit tiring to tread through and there is very little shade, so make sure you bring plenty of water on this excursion. Considering this was our inaugural trip to Death Valley, I’m pretty happy with the amount of hiking and sight-seeing we got to do in just 12 hours. That said, there is still a LOT left to explore in the park and surrounding area. If you’re lucky enough to have more than a day, be sure to check out some of the park’s other popular hikes and attractions. For my 30th birthday I knew I wanted to get off the grid for a few days. Not out of fear of turning 30 - I’ve been waiting to be 30 my whole life - but I wanted to escape somewhere my husband and I could both relax AND have some amazing adventures. We toyed around with a lot of ideas; from a 10-day Alaskan cruise to a quick trip up the coast to Big Sur, but nothing seemed to be quite right, until the day I stumbled upon Collective Retreats, a luxury camping resort with locations scattered across the country. The location that particularly peaked my interest was their retreat based in Big Sky, Montana, just an hour outside of Yellowstone National Park. Neither myself nor Mark had ever been to that part of the U.S. and with just a 2.5 hour flight from LA it felt like something we could manage in a long weekend. Soon enough August rolled around and it was time for our departure - or so we thought. Our excitement was brought to a halt thanks to a 2-hour flight delay. Normally, this wouldn’t stress me out, but knowing that we would still have to pick up our rental car and drive a good hour into unfamiliar mountains, now presumably in the dark, was not putting my mind at ease. Little did we know, that was just the beginning of our delays. We were stalled once again as we landed in Bozeman which only furthered our anxiety. Luckily, we made it out to Big Sky and down to the resort just as the last bit of sunlight was leaving the sky. The team members at Collective were very helpful and understanding. We originally had a BBQ-in-a-box dinner scheduled for that evening, which they happily cancelled for us free of charge due to our late arrival. The team also kindly waited for us to arrive, taking our bags once we reached the parking area and later directing us by flashlight to our cozy tent. Collective does everything to provide all of the amenities of a luxury hotel while still allowing you to feel connected to the outdoors. After a long day of traveling we were ready to unwind and the cozy details that adorned the tent, like the Pendleton blankets, wood burning stove and Frette bathrobes made falling back into relaxation mode a breeze. After a solid night’s sleep, we awoke early, snug in our king size bed under our heated blanket. It was hard to pull ourselves out from under the covers. The Montana mornings are fairly cool, even in August - but thankfully, our tent also came equipped with a fully functioning private bathroom and hot shower. While our tent was certainly a highlight, I think my favorite part about our stay at Collective was the breakfasts. Every morning we’d head to the main Lodge, sit out on the front porch looking out at Lone Pine Mountain and plot out our day while sipping coffee and devouring delicious egg scrambles and blueberry pancakes. The line to get into the park was pretty reasonable. As of August 2018 there was an entrance fee of $25. As we entered the park, we were pleasantly surprised by the lack of traffic. We’d heard nightmare stories of endless lines of cars, but sure enough after driving about 30 minutes we came upon our first Yellowstone traffic jam. We moved pretty slowly for a while, wondering what could possibly be causing such a slow down, when finally, after moving about 1mph for 15 minutes, we realized the hold up was due to some Elk that other motorists had spotted. This was our first, and would certainly not be our last animal jam of the day - if you’re heading to the park this is something you too should be prepared for! Our first stop inside the park was quick detour out to Firehole Falls. As you drive into the park, you’ll come to a Madison Junction, if you’re following the Lower Loop route, take a right toward Madison. Not far after this junction is Firehole Canyon Drive. As you continue up the road, you’ll eventually come to some pull outs and a small parking area available across from the falls. You can also find more parking up the road at the swimming area. The Firehole River plunges 40 feet over the Firehole Falls just before it intersects up with the Gibbon River at Madison Junction. Firehole Falls are surrounded by extremely steep rhyolitic rock cliffs that make up the Firehole Canyon. This little stop seemed to be lesser known, lightly trafficked and a beautiful way to kick off our morning. Our first geyser sighting of the day! This stop was really interesting because you get to see a little bit of all the different hydrothermal features that are scattered throughout the park. Along this short trail you will find geysers, hot springs, mud pots and fumaroles. Our first stop on this trail was the Celestine Spring. 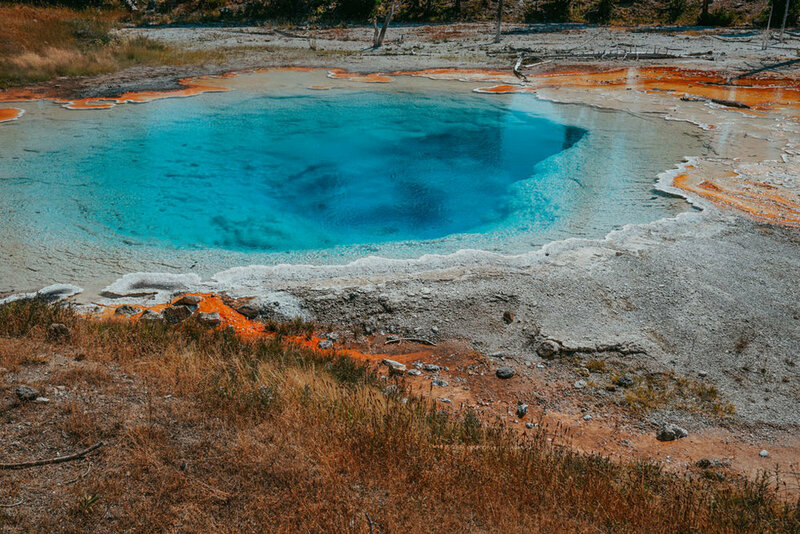 This was the first spring we had a close view of on our trip, and we were in complete awe of it’s insanely bright blue coloring annnd it’s sulfuric stink. Next on the trail we made our way to Fountain Paint Pot. This is one of many mud pots you can see in the park. In late summer, while we were at the park, the mud pots were fairly thick and as the sounds they emit as the air bubbles up to the surface is amazing. Lastly, we saw Clepsydra Geyser and Spasm Geyser. Clepsydra got it’s namesake from the Greek word for Watch Clock. Apparently, it used to erupt every three minutes, but then after an earthquake in the 50s, the geology under the surface changed, and it now erupts regularly without pause. Spasm, seen just in front of Clepsydra, is a deep blue bubbly geyser - one of our favorites in the park, maybe just because of it’s great name. This was the stop I had been waiting for because it’s home to the beautiful Grand Prismatic Spring. This is an extremely popular spot in the park. Getting into the parking area to find a spot took about 15 minutes, but we prevailed, and made our way out to the boardwalk trail that winds it’s way past Excelsior Geyser (which is one of the largest geysers in the park) over to an up close and personal view of Grand Prismatic Spring. The colors of Grand Prismatic Spring are simply mesmerizing. The saturated bands of orange, yellow and green that encircle the deep blue waters of the spring are created by heat-loving bacteria. You could stand here for hours just staring at the surreal colors and massive size of this hot spring. There are several other geysers along the boardwalk trail of the Midway Geyser Basin. One of our favorites to watch was Excelsior Geyser Crater. At one point in time it was an active geyser that erupted frequently - today, it is believed that the powerful eruptions damaged its internal plumbing system, and now is considered a productive hot spring that pours thousands of gallons of water every minute into the Firehole River. 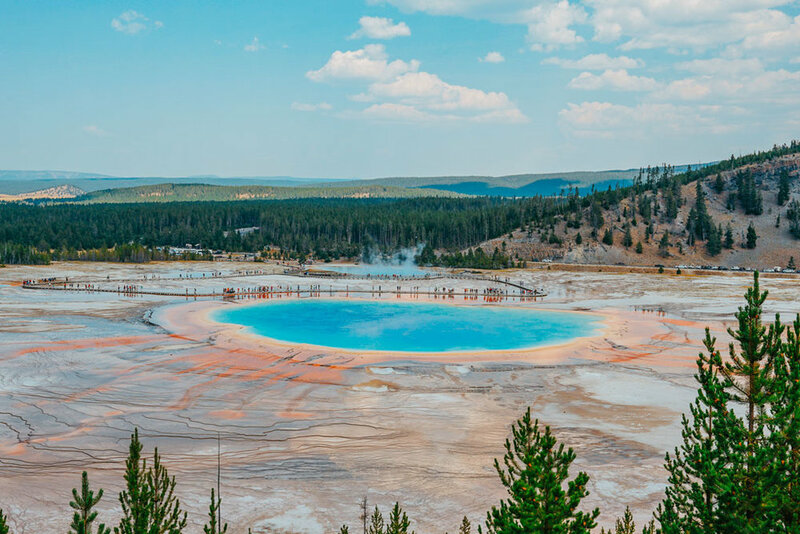 Now, if you want an even better view of Grand Prismatic Spring, the secret is to get back in your car and head up the road until you reach the next turn off for Fairy Falls Trailhead. If you take this trail up to the Grand Prismatic Spring Overlook and you will not be disappointed by this gorgeous birds eye perspective of the massive spring below. We decided it was time to eat, and obviously wanted to catch a glimpse of the most famous geothermal sight in the park, Old Faithful. First thing we did was check for the next estimated time of eruption, which on this day was 3:15 pm. We had 45 minutes to eat, so we popped inside Old Faithful Inn (which is a sight itself) and had a quick bite. We were pushing it for time, but managed to get out to the Geyser viewpoint by 3:10 for and early eruption at 3:12 pm. If you have more time, you can wander the boardwalks here and explore other amazing geysers. We were strapped for daylight, so we enjoyed ourselves as we watched Old Faithful burst 100s of feet into the sky just like clockwork. Just as we thought we were getting back on the road, about 2 miles past Old Faithful there was an opportunity to pull off and catch a glimpse of the beautiful Kepler Cascades. This three-tiered cascade falls more than 50 ft. into the Firehole River. Again, a low trafficked spot, it’s a nice place to pull off and get some peace and quiet - especially after all the crowds we encountered at Old Faithful. We were doing great on time, making our way past Yellowstone Lake into the Hayden Valley area when suddenly there was an abrupt halt in traffic. 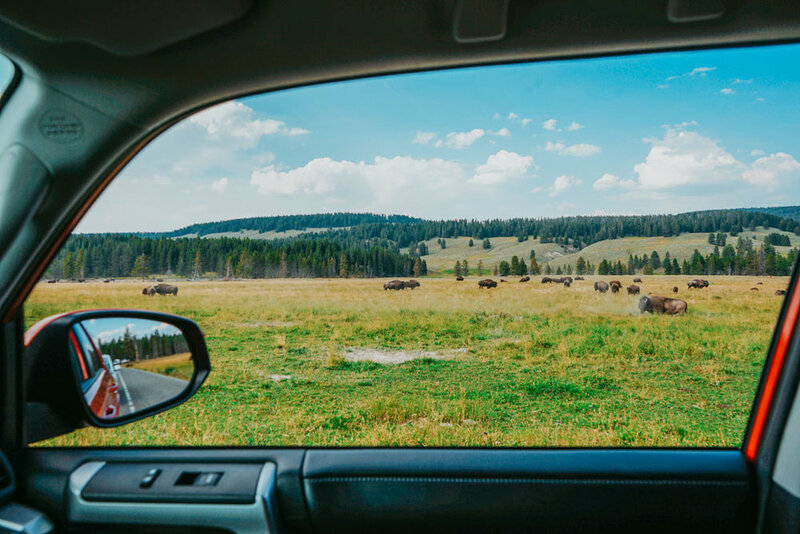 As we crawled along, we finally came to a meadow were we realized there was a big heard of Bison grazing… annnd hanging out in the middle of a road. We were trapped in a Bison Jam! Our arrival to Yellowstone also also coincided with the middle of the Bison Rut season. The rut begins in late July and goes through August. The males display their dominance by loudly bellowing, wallowing, and fighting other males. Once a male has found a female who is close to estrus, he will stay by her side (stage-5 clinger much?) until she is ready to mate with him. It was amazing to look out our car windows and see the rut happening right in front of us. The sound of the bulls bellowing and flopping around in the dirt was insane. As we slowly made our way through the valley, we had multiple bison walk RIGHT in front our car. It was incredible - but also nerve-racking, both because these animals are HUGE and intimidating, but also because we were losing daylight and I was still desperate to get to Artist Point to see the Grand Canyon of Yellowstone. Aside from Grand Prismatic Spring, Artist Point was one place I was dying to see. We made it just in time - right as Golden Hour was setting in we pulled into the parking lot. Unfortunately, this was also where we realized at some point that afternoon someone had backed into our rental car, leaving a massive dent in our bumper and hatchback. It was super disappointing to be walking up to this beautiful vista point, with the idea that we were going to have to deal with our insurance looming in the back of our heads. But this view is something else. I thought the Grand Canyon in Arizona was the most beautiful landscape I had ever seen to date, but Yellowstone’s version just might surpass it. We decided to make one final pit-stop to see the Brink of the Upper Falls. We took a turn up a short road located between the North and South Rim Drives that lead us up to a parking lot where we took a short walk to the brink of the 109 ft. Upper Falls, which is also the beginning of the Grand Canyon of the Yellowstone. This was a great way to end our day. As the sun was setting lower in the sky, the crowds were beginning to dwindle and we mostly had this spot to ourselves. There was still so much to be seen in the park, but we decided to call it a day around 7pm, and head back to the West Entrance. We arrived at the entrance around 8pm and popped back on the 191 back North toward Big Sky. On our ride back home, we noticed a fire that had grown in the mountains to our left. On our way down in the morning, it was very small and it seemed as though to be under control, but heading back we realized the fire had tripled in size and was putting out a LOT of smoke. It was a little concerning, but we made it back to Big Sky safe and sound. Unfortunately, nothing in Big Sky stays open past 9 pm (at least not in the Summer) - not even the grocery stores! We managed to sneak into the Hungry Moose Market & Deli just before they closed up shop and snagged a couple of their pre-made wraps. Not a very exciting dinner, but at least it was something. After a long day of driving and sight seeing we were pooped. I picked up a Yellowstone Ghost Story book at one of the gift-shops and we read that until our eyes grew heavy and we fell asleep once again, in our comfy bed. Sunday morning we awoke early, ready to explore the local area of Big Sky that surrounds Collective Retreat. As we unzipped the front door to our tent and stepped out on to our patio, we noticed a thick blanket of smoke was covering the sky. What was usually a prominent Lone Mountain in the towering above the resort was now just a blurry shadow looming in the distance. The faint smell of burning wood was in the air - and it wasn’t from last night’s s’more campfire - the wild fire we had past on the highway Saturday had continued to grow. We weren’t in any immediate danger, but we heard some neighboring towns were being evacuated, which put us a bit on edge. Our original plan was to head into Big Sky and take one of the Ski Lifts up to Lone Mountain for a more strenuous hike, but with the impending fires and heavy amount of smoke in the air, we decided it was best to do something closer to our home base and a little less strenuous on the lungs. While we sipped our coffee and ate our tasty scrambles I consulted my All Trails app to see what other adventures we could find in the area. After scrolling for a bit I came across Ousel Falls Trail, and upon doing a little reading and discussing it with some of the Collective staff we decided it was our best move. We scheduled ahead of time for Collective to prepare us lunch boxes to-go - a sandwich, chips, orange and cookie - so we picked up our boxes before heading out to find the Ousel Falls Trailhead. One thing we hadn’t anticipated was how popular this trail would be on a Sunday afternoon. Parking was a little tricky - there is a nice lot, but it was packed to the brim with massive Suburbans and families rolling six deep who happened to have the same idea as us. The 1.6 mile trail to Ousel Falls very well maintained and perfect for all skill levels - which makes sense as to why this is such a popular spot for families. The Gallatin river runs right along the trail and there are plenty of opportunities to climb down and enjoy the flowing river. The falls at the end of the trail are gorgeous and if you walk down the stone steps to the base of the falls there's a lovely pool to dip your feet or swim. After we spent some time relaxing by the falls we decided it was time to head back up to the resort. One amazing amenity that comes along with your stay with Collective Retreats Yellowstone is that you have access to Moonlight Basin Community perks, like the pool, hot tub, fitness center, and local hiking and biking trail network. Guests also have access to Ulery’s Lake, where there is a beach and dock stocked with canoes, paddle-boards, kayaks and concessions. We had yet to take advantage of this little perk, so we decided to head down and check it out. The air quality was still pretty poor, but we decided to grab a couple beers and hit the lake by canoe nonetheless. I honestly hadn’t been in a canoe since I was a 19 year old camp counselor, so there was something exciting and nostalgic about it - unfortunately, our time on the lake was cut short by a thunder storm. We quickly paddled back to shore, returned our oars and jumped back in the car as the rain began to pour and thunder cracked around all around us. Feeling a little dejected, we headed back down the hill to our tent. We laid listening to the rain pitter patter on the canvas above our bed, and then decided to make the most of this extra down time we suddenly had. We managed to make a reservation at a local restaurant, Horn and Cantle on Lone Mountain Ranch, just down the hill from Collective Retreats. Finally! A real hot meal. Our dinner did not disappoint - the atmosphere was beautiful, the dinner delicious and the little bit of wine was the perfect way to celebrate our last night in Montana. We wrapped up dinner just before sundown and to our excitement the smoke had seemingly cleared from the air and a beautiful sunset was underway. We stuck around Lone Mountain Ranch for a bit, making friends with the horses and gaping at how stunning the ranch was in the golden hour light. With our spirits restored, we finally made our way back to the resort, ready for our fireside s’more dessert and excited that, by some miracle, we’d be able to catch a glimpse of the Perseid Meteor shower. I could not have asked for a better way to spend my birthday. My only regret is that it couldn’t last longer! And while the trip had it’s challenges - from flight delays and fender benders to thunderstorms and wild fires - it seemed impossible to be in a bad mood while we were surrounded by such natural beauty.